It's not as if there was cause for great panic in Banditland entering 1995. The team wasn't defending champions, but it had reached the finals in its previous season. That made it 3 for 3 in terms of playing for a championship. The usual crew was back for 1995; players such as John Tavares, Jim Veltman, Troy Cordingley, Stu Aird and Darris Kilgour were all on the roster again as were goalies Ross Cowie and Bill Gerrie. But there were eight new faces on the roster at the start of the season, including MILL veterans Rosa and Dean Cecconi, rookie Jamie Batley, first-round draft pick Rodd Squire and Grant Johnston. 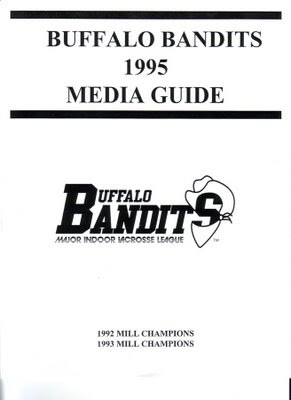 The Bandits had a new rival on the schedule in 1995. League officials obviously has noticed that Western New York had become a lacrosse hotbed, and opted to place a new team in Rochester. They were called the Knighthawks, and they'd be rivals for years to come. Head coach Barry Powless and assistant coach Paul Day were original Bandits from 1992, and former Bandits included Randy Mearns, Brian Silcott, Mark Burnam, Bill Meagher, Tom Emmick and goaltender Clayton Henry. The first order of business came on opening night, when the Philadelphia Wings came to town. The Bandts made sure that the Wings' defense of their MILL title wasn't a happy one, as Buffalo took a 17-13 decision. "They had beaten us convincingly the last two times we played them, so we knew it was time for us to turn the tables on them," said Cordingley. "It was a big game for us. It was all about coming out and working harder than them. And we proved we were willing to do it. We're back." Maybe not. The Bandits dropped their next three starts, including a 17-10 loss in Philadelphia on January 28. "It's always something like that this year, it seems," Rich Kilgour said. "One or two goals in a row and we just can't weather the storm. It's getting kind of frustrating. We're getting a little taste of Bills syndrome. Like them, it seems we're everybody's big game, everybody wants a piece of us. Every player has to start taking it upon himself to do something about it and come back strong from this." Buffalo did defeat New York to end its first three-game losing streak since 1992, but then lost two out of three to finish the season at 3-5. It was the first time in team history that it finished the regular season with a losing record. Two of the defeats -- including one at the end of the regular season -- came at the hands of the Knighthawks, giving the rivalry a boost. "I'm proud that our guys played that second half hard even though they had just played three hard halves in a very short amount of time," said Veltman, who had two goals and four assists in the season finale. "But you have to look at what happened with us the whole season, not just today. People wrote us off coming into the weekend and that was a motivator. I think we came together pretty well this weekend. ... Now we just have to wait it out." While the season was a disappointment, the usual postseason honors came Buffalo's way. Tavares and Veltman were on the first all-star team. The Bandits did qualify for the playoffs despite finishing fourth out of six teams. They even hosted a first-round game on March 25 thanks to their strong attendance figures. Buffalo's postseason visit, though, was a short one. Buffalo led by as many as seven goals in the first half of the semifinal, and then lost to Philadelphia, 19-16. Gary Gait of the Wings (six goals, three assists) was the game's Most Valuable Player. "This game was exactly like our season," coach Les Bartley said. "We played with excellence and we played poorly at times. We were penalty-free for a while then we took bad penalties. It just wraps up where we've been all year long." Only 10,557 turned out in Memorial Auditorium for the game. Philadelphia went on to win the championship from Rochester, 15-14 in overtime, for its fourth title in nine seasons. Buffalo was left to watch the title game for the first time in its history. The Wings clearly had set a standard of excellence in indoor lacrosse. If the Bandits were going to match it, they would need some changes.